We’ve just released our brand new Time Tracker for Paydirt, totally rebuilt from the ground up, and we’re pretty excited to tell you all about it. For the most part, the time tracker fundamentally works just as it did before, so you don’t need to learn a new workflow. But there are heaps of improvements and additions which we’ve included based on your feedback, as well as what we’ve learned ourselves from years of daily use! Ever forget to start a new timer after stopping the current one? Along with our usual options for starting a timer in the past (5, 10, 15, 20, 30, 60 minutes ago), you can now start a timer whenever the last timer was stopped. Sometimes it’s not immediately clear which task your work is going to be for; it depends which direction you get taken in. 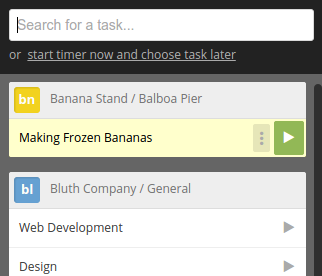 Now you can start a timer ticking, and choose the task for it later. Sometimes it seems clear which task you were working on, but then you end up working on something different. Now you can change the task for a timer while it’s running. The billing rate will update automatically. Ever start a timer and then distracted for ten minutes? 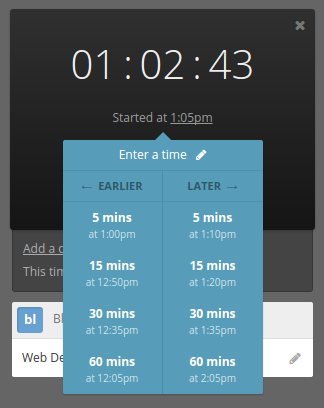 We’ve added a handy dropdown to help you push the start-time of a timer forwards or backwards in a click. You can also enter any other time manually. Start a timer without touching the mouse! 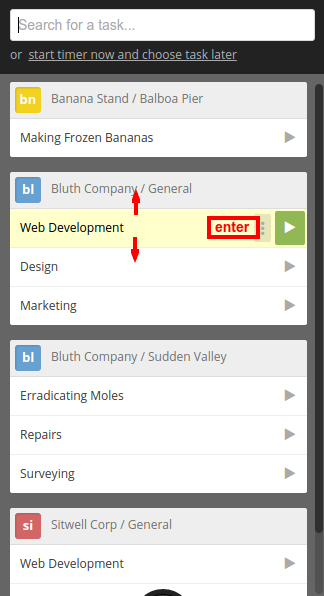 When searching for a task, use the [up] and [down] arrow keys to change the highlighted task in the search results. Hit the [enter] key to start a timer for the highlighted task. Click on the list icon at the bottom of the time tracker to see the time you’ve logged today and yesterday. 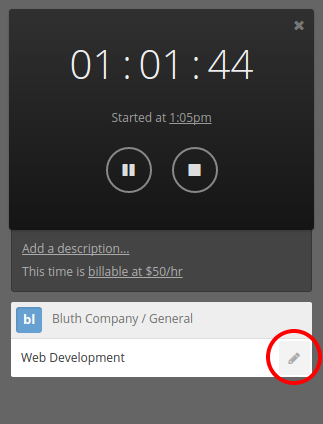 You can edit and delete time logs by clicking the dropdown menu on the bottom right corner. 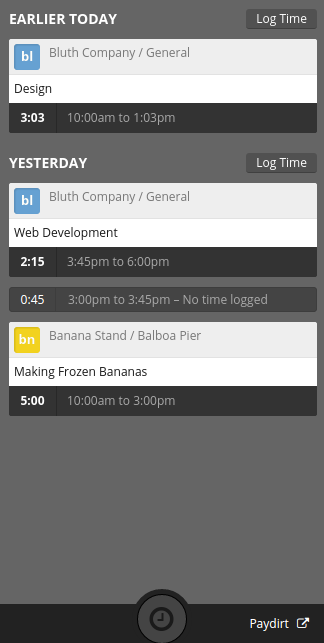 You can toggle back and forth between the time tracker and recent time views. Empty slots between time logs are marked out. Clicked on one to fill in the gap! 7. Finally, it’s lightning fast! 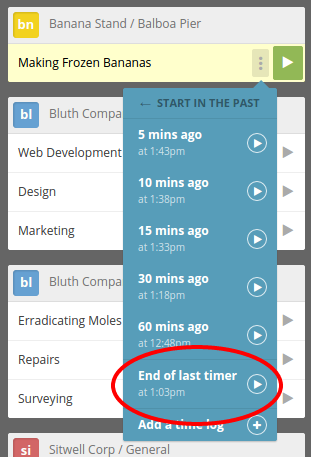 Our old time tracker worked great for a small number of tasks, but accounts with thousands of tasks were starting to notice performance problems. Those are now a thing of the past. The time tracker loads super fast, renders fast, and searches through tasks fast, even if you have tens of thousands of tasks. For this, a lot of credit goes to the contributors of React Project, which we’re very happy to be using in Paydirt. 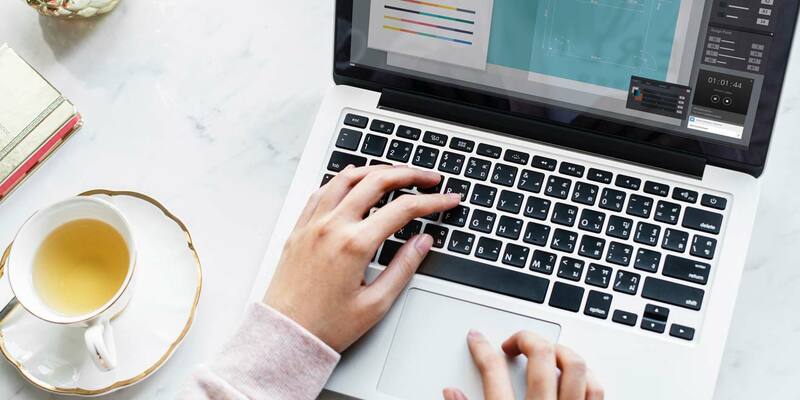 We hope these improvements make your time tracking easier than ever. As always, if you have any issues or feedback, drop us a line at talk@paydirtapp.com or tweet us @paydirtapp.